We're very sad to see the return of all the miserable weather, we know we complained the snow was too cold but at least it was much prettier than all this rain. However the floral print goddess herself has come to the rescue with the new Cath Kidston by Fulton range. 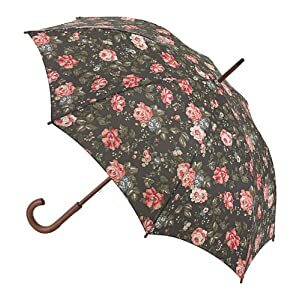 The collections includes Fulton’s trusted umbrellas, a range of raincoats, hats, ‘cag-in-bag’s’ and wellies all featuring Cath Kidston’s beautiful iconic prints, from striking polka dots to fashionable florals. They're definitely helping us to beat those winter blues! The sturdy Italian-inspired ‘Kensington’ (RRP £25) has a comfortable wooden handle with a large canopy providing unbeatable protection. The ‘Superslim Gift Box’ (£22), available in ‘Provence Red Rose’ print, is one of Cath Kidston’s most recognisable patterns. This would make an ideal present and the perfect Christmas stocking-filler.